A guy goes to a doctor and says that when he pokes his eye it hurts. The doctor advises not to poke the eye. The patient is satisfied. 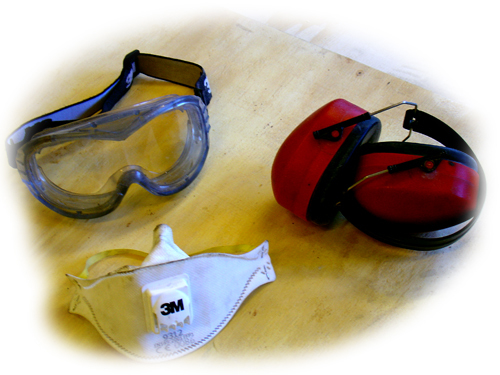 In order for us to be satisfied after our work sessions with the boat we use the following protection: ear muffs, protective goggles, dust mask, common sense. With the combination of these elements, a lot of pain can be avoided. A couple of notes on these pieces. If you have four eyes like us two, then get a dust mask with a ventilation valve. The valve means that the warm moist air you breathe out does not condensate on your eye gear, which also means that you save nerves and fingers. Now to the four eye aspect of buying dust masks. You will have four eyes anyway, because you will be wearing an eye protection, for example when using a plunge router. So forth, so forth. Citing B. A. Baracus;”I don’t like receiving pain, but I like to give it out.” Make your wood hurt and be safe!